Many companies have done away with sick leave, vacation days, and personal days as employee benefits and have replaced all of them with a PTO plan. The acronym means "paid time off" or "personal time off" and, while many employees welcome the change, it can lead to costly mistakes for a company if it is not implemented well. An employee's PTO is a number of hours in a virtual bank from which employees can make withdrawals. Employers credit additional hours to each employee's bank over time, usually with every pay period. Most American employers who use the more traditional system offer most of their workers 10 paid holidays, two weeks of paid vacation, two personal days, and eight sick leave days per year. Under a PTO plan, the employees would instead be credited with 30 days paid time off per year. The calculation method depends on the pay schedule. With a bi-weekly pay schedule (that is, 26 paydays a year), employees are credited 1.3 days of PTO every two weeks. With a semi-monthly pay schedule is used (that is, payday is the first and 15th of each month), employees accrue 1.25 days PTO on each of 24 pay periods. 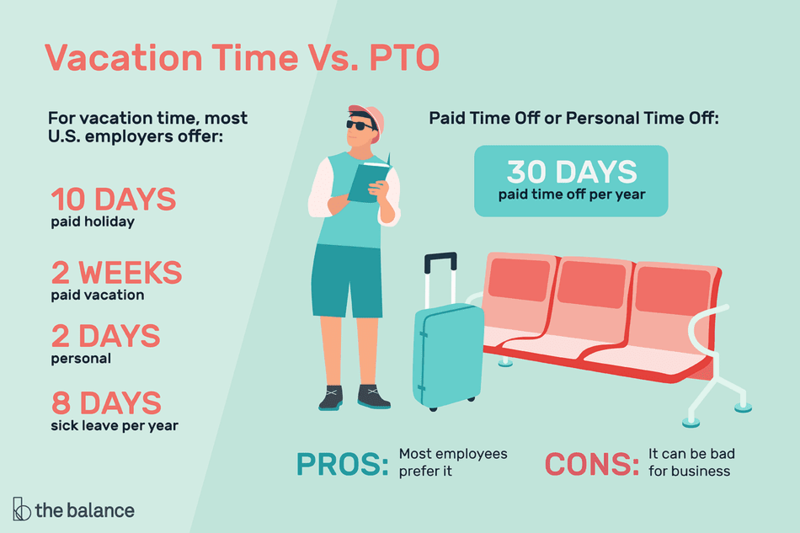 A PTO plan makes your company more attractive to prospective employees by increasing the number of days they can take off from work and still get paid if they are generally in good health. Since most employees will never use all their sick days, they can take the difference as extra vacation time. There is no cost to the company and employees are happier. A PTO can cause problems for a business if its employees feel free to call in at the last minute and use up some PTO time. This can be managed by requiring prior approval for any use of PTO. But employers must understand that employees who never used their full allotment of sick leave will surely use all of their PTO every year. It's called planned sick leave. One of the most common problems is caused by sick employees who don't want to waste their PTO on mere illnesses. There's a tendency to horde paid time off as vacation time. When employees get sick, they stagger into work anyway to avoid using up paid time off. This makes other workers ill and productivity drops as more and more of the workforce gets sick. Make sure it suits the company culture. A PTO plan works best for a company with a high degree of flexibility. Establish clear guidelines in advance. If you require employees to request PTO in advance except for emergencies, define emergency and enforce it. If there are calendar dates when the company can ill afford many absences, tell employees that up front. Manage the people, not just the PTO. If employees come into work sick, send them home. You have an obligation to protect the rest of your employees.